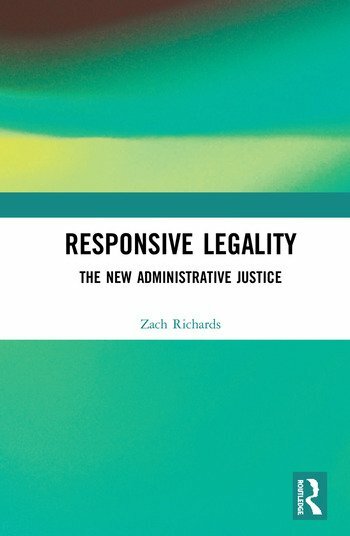 Responsive Legality is an important book about twenty first century justice. It explores the legal and moral values that twenty-first-century public officials use to make their decisions, engaging existing theoretical models of administrative justice and updating them to reflect changed twenty-first-century conditions. Together, these features of twenty-first century public administration are coined ‘responsive legality’. Whereas twentieth-century public officials were generally driven by their concern for bureaucratic rationality, professional treatment, moral judgement and – towards the end of the century – the logics of ‘new managerialism’, the twenty-first-century public official embodies greater complexity in their characteristic pursuit of substantive and procedural justice. In responsive legality, government decision makers show a distinct concern for the protective parameters of the rule of law, a purposive pursuit of fair outcomes and a commitment to flexible decision making.